Identification: This aeolid has a transparent body sprinkled with minute opalescent white flecks. There are scattered burnt-orange and dark brown flecks on the body, some fusing into short irregular lines. The cerata have three tuberculate swellings: the apical very small, the medial large and the basal intermediate in size. The rhinophores are smooth and translucent-orange with white bands at the base, midpoint and apex. 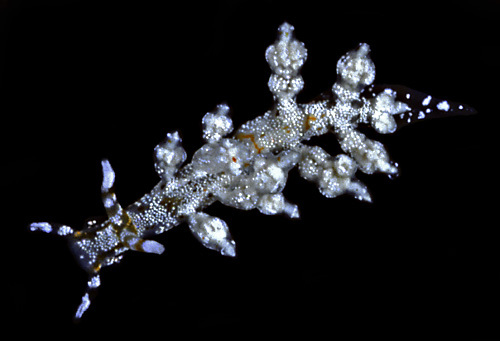 The cephalic tentacles are also translucent-orange with white bands at the base and apex..
Natural history: Eubranchus sp. #1 is a moderately rare species found in moderately exposed to exposed rocky locations at 6-24 m (20-80 ft). It has also been found in Halimeda kanaloana beds at depths of 9-20 m (30-66 ft). It appears to be mature by a length of 2.5 mm and lays a white egg mass. A 1/2 whorl mass laid by a 2.5 mm animal hatched in about 3.5 days in the laboratory. Distribution: Big Island, Maui and Midway: widely distributed in the western & central Pacific. Taxonomic notes: It was first recorded in Hawaii off Makena, Maui by PF on Dec. 14, 1988. Photo: PF: 4 mm: off Makena, Maui; Dec. 14, 1988.